The mid-size truck market in the United States commands little attention in comparison to the behemoth that is the full-size truck segment. ‘Mericans like big. The reality of the situation is reflected by a lack of options for those seeking modest dimensions and one of the few remaining is the Nissan Frontier. 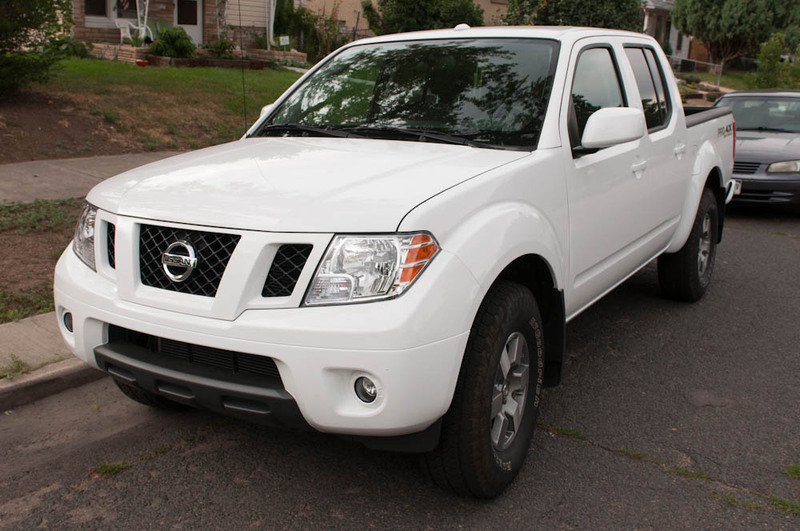 I reviewed the 2012 Nissan Frontier Crew Cab PRO-4X, the most off-road ready member of the Frontier lineup with ample passenger room all while retaining good day-to-day drivability. It is a handsome truck and the PRO-4X trim level truck wears its rugged off-road elements well. Body-color fender flares adorn each corner and the front set meld into a nice plastic bumper and grille. On the ground 16-inch wheels are shorn with beefy all-terrain tires and mud flaps hang behind each one. Immediately noticeable is the shortness of the bed, the PRO-4X I tested came with a standard five-foot box (a six-footer is available), the shorter box does make the truck quite maneuverable and gives it a favorable wheelbase for off-roading but hauling gear can be a bit of a challenge. Nissan’s inclusion of a very useful cargo management system makes hauling less of a challenge. The 2012 Nissan Frontier Crew Cab PRO-4X that I drove was equipped with a very nice no-nonsense cloth interior dressed in black and red. The PRO-4X trim also includes power windows and door locks, an upgraded Rockford Fosgate stereo, Bluetooth connectivity, and satellite radio. The Rockford Fosgate sound system was surprisingly good with deep bass, great tonal reproduction and while the display was simple it was easy to use. The front buckets were comfortable and provided good support when I got the truck bumping over rougher terrain. Legroom was surprisingly ample both in the front and rear. Interior storage was also ample thanks to a folding rear seat – perfect for rainy days. The 2012 Nissan Frontier starts out with a 2.5-liter, four-cylinder engine good for 152 horsepower and 171 lb-ft of torque with fuel mileage figures of 19-mpg city and 23-mpg highway. Transmission choices include a five-speed manual and a five-speed automatic. My PRO-4X model came with an optional 4.0-liter V-6, capable of producing 261 horsepower and 281 lb-ft of torque the motor can be paired to either a six-speed manual gearbox or a five-speed automatic, I had the auto. Fuel economy is listed at 15-mpg city and 20-mpg highway and my average was 17. The 4.0-liter V-6 provides plenty of power, it will even spin-up the tires from a stoplight and it works quite well on the highway or off-road too. The five-speed automatic was smooth and never felt like it was breaking a sweat. The PRO-4X rides tall and features a solid rear axle – if you are driving alone you might notices some back-end movement over larger bumps or in hard turns. Off-road the truck performed flawlessly handling steep, wet and loose gravel, rock and mud with ease. Both the hill-descent control and hill-start systems worked well and took the drama out of moving a heavily laden truck on steep terrain. Noise in the cabin during all the testing remained acceptable at all speeds and over all terrains. The 2012 Nissan Frontier PRO-4X offers an exceptional balance between daily practicality, off-road capability and hauling capacity. It is not so big as to be a burden in traffic, but is still capable of towing and hauling a reasonable amount of tonnage and it doesn’t gulp fuel. The best of all worlds: great off-road capability, maneuverability in the city and great hauling capacity for its size. My Frontier PRO-4x came in at $31,275. Driving the Nissan Frontier Crew Cab PRO-4X is like driving a five-passenger sedan with quite a bit of utility, power and fun without radical sacrifices at the fuel pump or when finding downtown parking.